We were lucky enough to have a personal visit from Alan Lee who signed in our bookshop in April 2017. Painstakingly restored from Tolkien’s manuscripts and presented for the first time as a continuous and standalone story, the epic tale of Beren and Luthien will reunite fans of The Hobbit and The Lord of the Rings with Elves and Men, Dwarves and Orcs and the rich landscape and creatures unique to Tolkien’s Middle-earth. 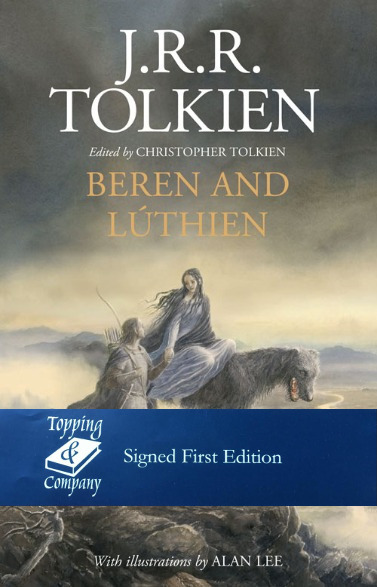 The tale of Beren and Luthien was, or became, an essential element in the evolution of The Silmarillion, the myths and legends of the First Age of the World conceived by J.R.R. Tolkien. Returning from France and the battle of the Somme at the end of 1916, he wrote the tale in the following year. Essential to the story, and never changed, is the fate that shadowed the love of Beren and Luthien: for Beren was a mortal man, but Luthien was an immortal Elf. Her father, a great Elvish lord, in deep opposition to Beren, imposed on him an impossible task that he must perform before he might wed Luthien.